A range-restricted (EOO 920 km², AOO <920 km²), but still fairly common species that is affected by competition from alien invasive plants across most of its range. There are an estimated five to 10 locations, and at least one known subpopulation is declining due to spreading, unmanaged alien invasive plants. Subpopulations on Noordhoek Peak are threatened by competition from severe alien invasive pine infestations (N.A. Helme pers. obs. 2011). 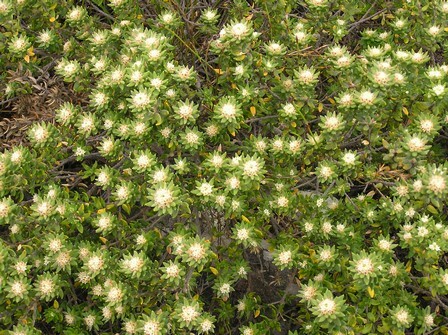 Elsewhere on the Cape Peninsula, efforts have been made to clear alien invasive plants, but ongoing management is needed to prevent reinvasions. Subpopulations in Jonkershoek are not currently threatened, but the lower slopes of the valley are also under timber plantations, and escaping pine seedlings spreading up the slopes is a potential threat. This species is common across the Cape Peninsula, From Camp's Bay and Devil's Peak to Cape Point. Goldblatt and Manning (2000) and Manning and Goldblatt (2012) indicate that it occurs in Jonkershoek, but the species' distribution and abundance in this area is poorly known. Goldblatt, P. and Manning, J.C. 2000. Cape Plants: A conspectus of the Cape Flora of South Africa. Strelitzia 9. National Botanical Institute, Cape Town. Pillans, N.S. 1942. 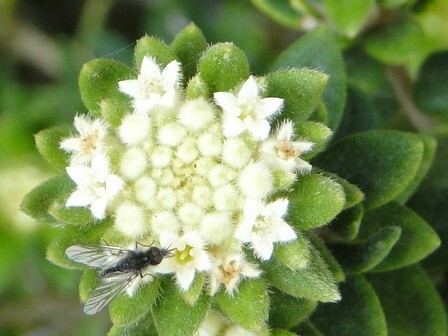 The genus Phylica, Linn. Journal of South African Botany 8(1):1-164.